Bone broth is all the rage right now. I was first introduced to bone broth last year at Natural Products Expo West. At first I was a bit apprehensive to try it, and now I love it! The flavor is incredible and it’s much more nutritious than the standard chicken and beef broth you can buy from a grocery store. I even sip it out of a coffee cup sometimes as an afternoon snack mixed with greens. Delish. So what makes beef bone broth so much more nutritious and delicious? By putting the beef bones through a long cooking process, it breaks down the protein collagen, into a more digestible form called gelatin. This gelatin contains many amino acids and antioxidants that are not found in your run-of-the-mill canned soup stock. The antioxidants and amino acids boost yourimmune system and aid your digestive system. The only problem to this delicious recipe is that it takes 12-24 hours to simmer the beef bones and it can be a messy process. Unfortunately I have to be real and this is just not something I really have time for or want to be doing. 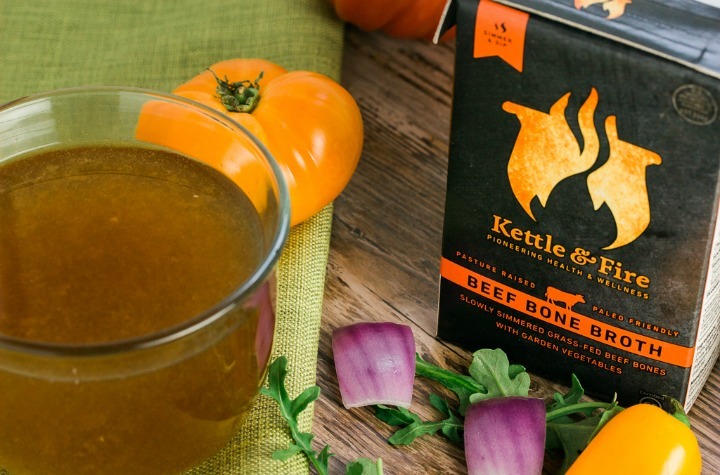 This is why I am so stoked to have found Kettle & Fire Beef Bone Broth. I was first introduced to Kettle & Fire by my nutritionist who recommended that I keep this on hand as a snack. It’s really good. I haven’t seen Kettle & Fire sold in stores yet, but if you have please reply in the comments and let everyone know! If you do want to try making beef bone broth at home, here is a great beef bone broth recipe. This recipe uses simple ingredients and it’s easy to make. Preheat oven to 400 F. Place bones in a single layer on a sheet or roasting pan. Drizzle with olive oil to evenly coat. Roast for 30 minutes, then, flip each bone over and roast for an additional 30 minutes. Place the roasted bones, bay leaf and cider vinegar and chopped vegetables in a large crock pot or soup pot. Completely cover the ingredients with water and bring to a high simmer. Reduce the heat to low and let simmer for 12-24 hours. Throughout simmering, add water as needed to keep all the ingredients submerged. Once the broth has reached a dark rich brown color, remove from heat. Discard the bones, vegetables and bay leaf and strain through a cheesecloth. Cool the pot to room temperature. Once at room temperature pour into jars and let cool in the refrigerator for at least 1 hour. When you are ready to serve, skim the condensed fat off the top of the broth and heat to the desired temperature. There you have it. 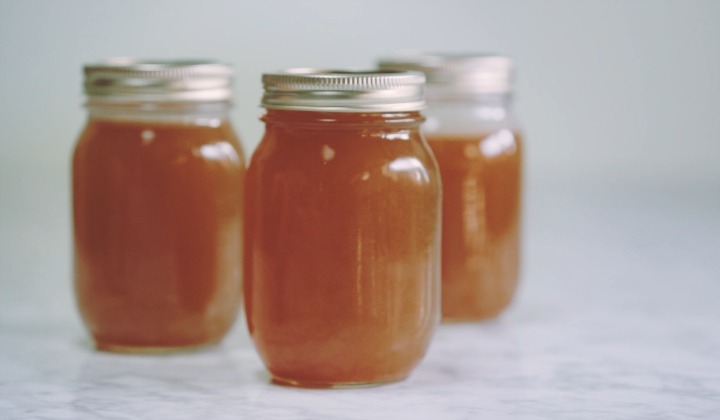 Two great ways to enjoy beef bone broth by either making it yourself using this beef bone broth recipe or buying a carton. After reading the above, which way do you prefer?